In early 2008 a new class of high temperature superconductors was discovered based on compounds containing iron arsenide layers such as LaFeAsO and BaFe2As2. Superconducting transition temperatures as high as 55 K have been confirmed in this class of material and there is abundant evidence that, rather like in the case of the cuprate superconductors, the superconductivity in these compounds cannot be explained using well-established theories of superconductivity. Our work is focused on making new compounds containing iron arsenide or iron selenide layers and investigating the link between superconductivity, composition, crystal structure and magnetism. Our early results in this area include the discovery of superconductivity in LiFeAs and the synthesis of an isostructural analogue NaFeAs which lies at the boundary between antiferromagnetism and superconductivity. Recently we have described chemical approaches to controlling the superconductivity in iron selenides using the intercalation of lithium and ammonia into iron selenide, and using hydrothermal synthesis. We are collaborating extensively with colleagues in Oxford Physics and at the Diamond Light Source, and with other colleagues around the World in understanding these exciting new materials. The oxide and chalcogenide (sulfide, selenide or telluride) ions differ in both size and chemical requirements. 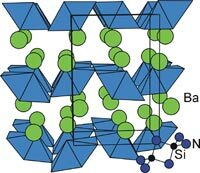 Segregation into distinct oxide and chalcogenide (Ch) portions is the norm and layered structures often result as in the homologous series shown. We have recently shown the effect on the structures and magnetic properties of tuning the oxide content in the perovskite-like block of oxide-rich Sr4Mn3O8-dCu2Ch2 by low temperature oxidation and reduction. 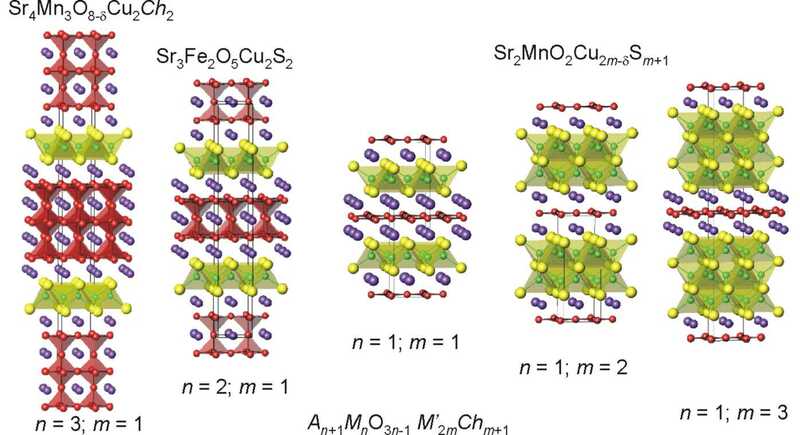 For the sulfide-rich series Sr2MnO2.Cu2mSm+1 (m = 1 - 3) we are understanding the interplay of structures and physical properties. The sulfide-rich members also have intriguing chemical properties and we are investigating, with Clare Grey at Cambridge, the reversible exchange of copper by lithium in these systems - relevant in the context of rechargeable lithium ion batteries. Recently we have shown that orange, insulating TiIV compound Y2Ti2O5S2 with a defective n = 2 Ruddlesden-Popper type structure may be reduced to two different metallic compounds NaY2Ti2O5S2 by means of reductive intercalation of sodium under thermodynamic control into the oxide layers or, via kinetic control, into the sulfide layers. Insertion into the sulfide layers was unexpected and shows the importance of using soft chemical approaches. The lithiated analogues LixY2Ti2O5S2 show an insulator-to-metal transition accompanied by a Jahn-Teller distortion as x increases. Because nitrogen is less electronegative than oxygen, nitrides, containing the N3- ion, exhibit a range of and properties somewhat different from those of the more familiar oxides. For example, BaSiN2 prepared as single crystals in molten sodium at 900°C or by the low temperature oxidation of the intermetallic BaSi by ammonia crystallises in a new structure type containing a network of edge-sharing SiN4 tetrahedra, which are not found in the analogous silicates. This motif exists in nitridosilicates and not in oxosilicates, because the more polarisable nitride ion can better screen the repulsion between the silicon atoms. The reaction between intermetallic compounds and ammonia is a rich source of new nitrides. 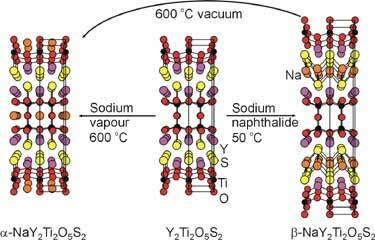 in 2005 we synthesised the first ternary tin nitride NaSnN, which is also the first example of divalent tin in a nitride. We are able to use a very wide variety of synthetic techniques. Conventional high-temperature “ceramic” processing is important, and very high temperatures (up to 2000 °C) may be achieved under rigorously inert conditions using arc and induction furnaces. Crystal growth of new materials is carried out in molten metals or molten halide fluxes at temperatures between 500 and 1000 °C. Reactive atmospheres may be employed, and flowing ammonia is an excellent source of nitrogen in nitrides and oxynitrides. Often reactions of reactive precursors with flowing ammonia are carried out at relatively low temperatures (200 – 500 °C), and we are increasingly using lower temperature routes to access solids with metastable structures. These methods include solvothermal synthesis of nitrides in liquid ammonia, and the reductive intercalation of alkali metals into suitable solid hosts using reagents such as n-BuLi or alkali metal/ammonia solutions. The group has two glove boxes for handling air-sensitive solids. We use a very wide range of techniques for structural and electronic characterisation. X-ray powder diffraction, X-ray single crystal diffraction, electron microscopy, SQUID magnetometry and electrical conductivity measurements are all available in the Inorganic Chemistry Laboratory and other measurements are carried out in Oxford Physics. 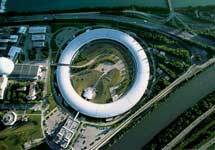 Synchrotron X-ray diffraction is carried out at the ESRF, Grenoble, and at the nearby Diamond Light Source. Neutron powder diffraction studies at the ISIS facility and the ILL, Grenoble are also routinely used for detailed structural characterisation.